Watching the night sky from the western edge of the continent at this latitude at this time of year presents a gamble. Announcements that a full moon would light the way for midnight mass-goers this year overlooked our forecast rain showers and our understandable preference for warm, lit, cosy quarters over damp, dark, blustery venues. Even on December 21, clouds ruled the night. They blocked views of the annual Ursid meteor shower. If the weather had cooperated, the solar-reflector qualities of the nearly full moon so enjoyed elsewhere would have washed out sightings of falling stars we might otherwise have caught. Before the Ursids zipped by behind thick cloud cover, we could have tried our night-sky luck with the much more spectacular Geminids. This shower peaked on December 13 and 14. Typically, as many as 120 meteors can be observed each hour at its height. If you missed both of those showers, you may have better luck next week, when the first meteor shower of 2016, the Quadrantids, starts pinging the atmosphere. Peaking January 4, the Quadrantids typically stretch from the end of December to the second week of January. The peak of the Quadrantids, however, lasts mere hours—a narrow window of opportunity made narrower by rare windows in the season’s clouds. 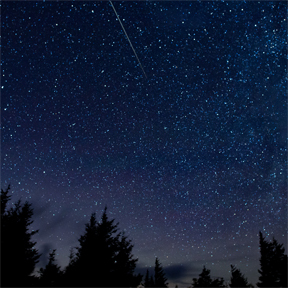 Although meteor showers are named for the constellations they appear (to Earthlings) to radiate from, their origins are closer to hand and more prosaic. If the asteroid 2003 EH1 were a piece of fruitcake being snarfed by Nature Boy as he walks around the house, the Quadrantid meteor shower is the trail of crumbs and peel left behind. If asteroid 3200 Phaethon were a date square in Nature Boy’s hand, the Geminid meteor shower—named for constellation Gemini from whence the meteors seem to emerge—would be the sugary oats scattered in his wake. And the Ursid meteor shower is to comet 8P/Tuttle (also known to sky-wonks as Mechain–Tuttle’s Comet) as a trail of crumbs is to a partially eaten Santa-shaped sugar cookie in strolling Nature Boy’s hand. Meteor showers, in other words, are messes left behind in a universe where starry wanderers drop their socks and underpants (Heavens! ), dribble their coffee, and trail tissues and bits of food wherever they pass—and never, ever sweep up after themselves. Housekeeping duty falls to others that barrel blindly through the debris paths at irregular intervals and frequencies. It’s inefficient to the extreme. Every year, for example, Earth charges through the particles and dust left behind by asteroids 2003 EH1 and 3200 Phaethon, Comet 8P/Tuttle and similar heavenly hobos, and every year, even after all these eons, the night sky still flashes and flares as the debris hits and is incinerated in our planet’s upper atmosphere. We sweep through comet Halley’s debris trail twice each year, first this way, then that, as we orbit the sun. Comet Halley provides us with both the Eta Aquarid meteor shower, which peaks May 6 and 7 in 2016, and the Orionid meteor shower, at its best October 21 and 22. There are also comets Marsden and Kracht (Delta Aquarid meteor shower, July 28 and 29), comet 21P Giacobini-Zinner (Draconids, October 7), asteroid 2004 TG10 (Taurids, November 4 and 5), and comet Tempel-Tuttle (Leonids, November 17 and 18). The most predictably rewarding meteor shower of the year comes courtesy of comet Swift-Tuttle—the Perseids will peak August 12 and 13, 2016, near summer’s height. If, however, you hope to take your chances on catching the approaching Quadrantids, find a dark place without artificial lights washing out the sky, dress warmly, and bring blankets, a comfortable chair, a thermos of something hot to help keep you warm, and maybe some fruitcake, date squares or cookies, too. Meteor watching requires time and patience, and for that, you need to be warm, fed and comfortable. You also need clear skies. Good luck with that. A version of this editorial appears in the December 27 edition of the Victoria Times Colonist.